Most of us in Cardiff will be familiar with the Holland House Hotel. 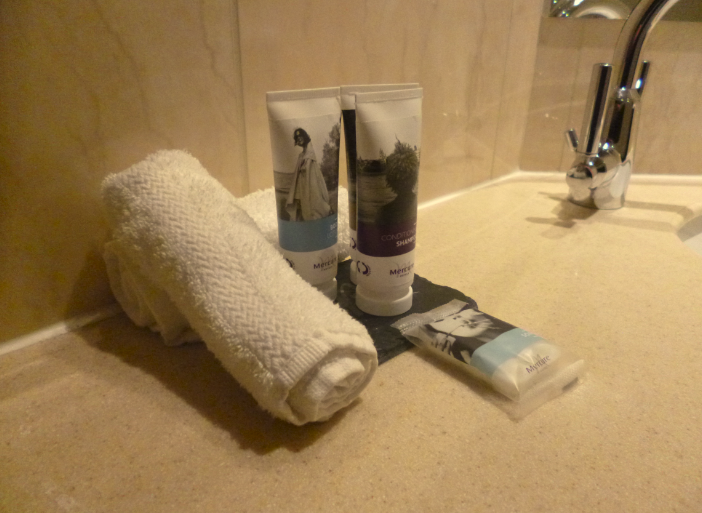 The city’s Mercure 4 star hotel situated on Newport Road is one that many of us have visited over the years. You may have spent the day at the spa, met friends for drinks or a meal, stayed the night or even attended a conference. The hotel has recently had a major refurbishment and my husband and I were fortunate enough to be offered a night stay with dinner to experience the new changes for ourselves. It was late afternoon when we arrived, and we planned on making our way straight to reception to check in. The refurbishment has done away with the traditional reception desk, which was confusing at first but we were promptly greeted by Maria. We asked to check in so Maria guided us to a comfortable seating area within the lobby itself. Armed with an iPad and the latest technology Maria checked us in there and then. I liked this efficient yet informal way of checking in. Our room was on the 11th floor, we had been treated to one of the eight corner rooms in the hotel, and the view is spectacular to say the least. As well as the majestic scene of the city, the view is so far reaching that you get to appreciate the rolling countryside surrounding Cardiff too. The room itself was certainly one of the largest we have ever stayed in. In one corner of the L shaped room was a cosy seating area for two. 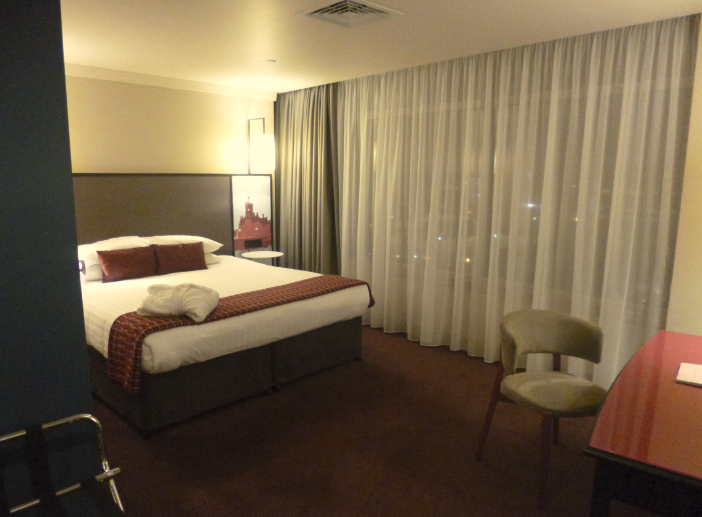 There was a well-lit dressing table, a flat screen TV and a fabulous bed, I imagine it was at least a king-size. 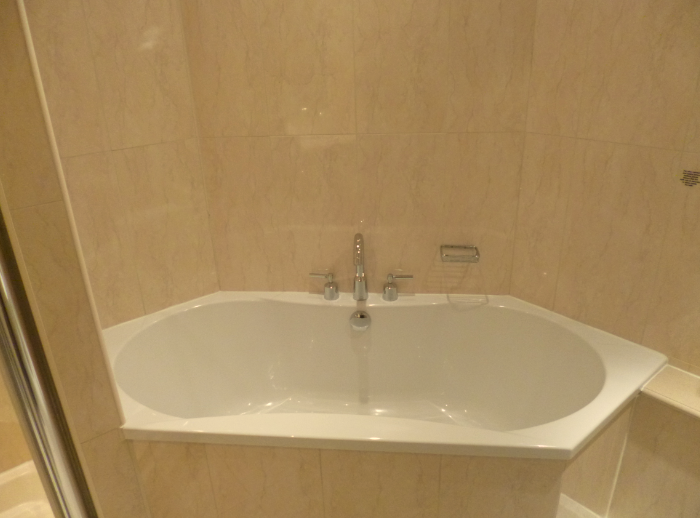 All rooms are en suite and ours was perfect, spotlessly clean, beautifully finished with an amazingly deep luxurious bath that I later sunk into. We soon made our way back downstairs for a drink before dinner, we took a seat at one of the intimate seating areas surrounding the circular bar. The whole area has been transformed with welsh influences in mind. 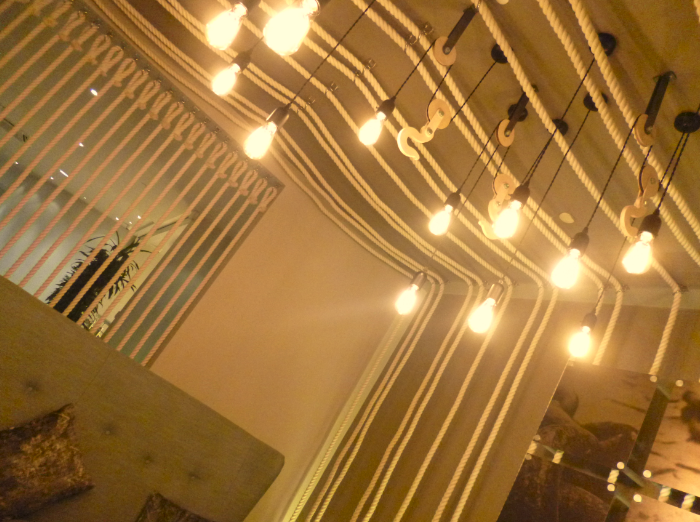 The lighting includes stunning pendants made from welsh copper. Gorgeous historical photographs of Cardiff adorn the walls. 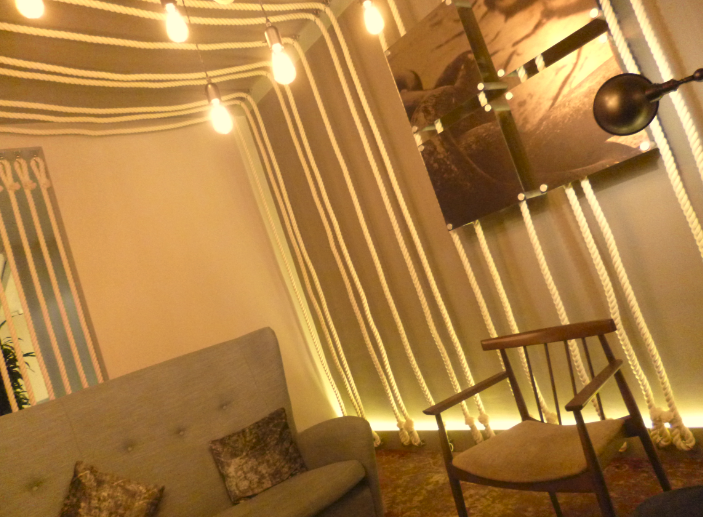 The bay is also brought closer with one of my favourite features; the use of rope to creative individual seating areas. It’s such a clever idea and something I haven’t seen anywhere else. Even if you’re not staying at the hotel I recommend popping in for an afternoon coffee or evening drinks, the décor and ambience are well worth taking advantage of. After our drinks we headed over to the Urban Bar and Kitchen, our server was Marta and we couldn’t have asked for a nicer member of staff. She was friendly, professional and knew the menu like the back of her hand. 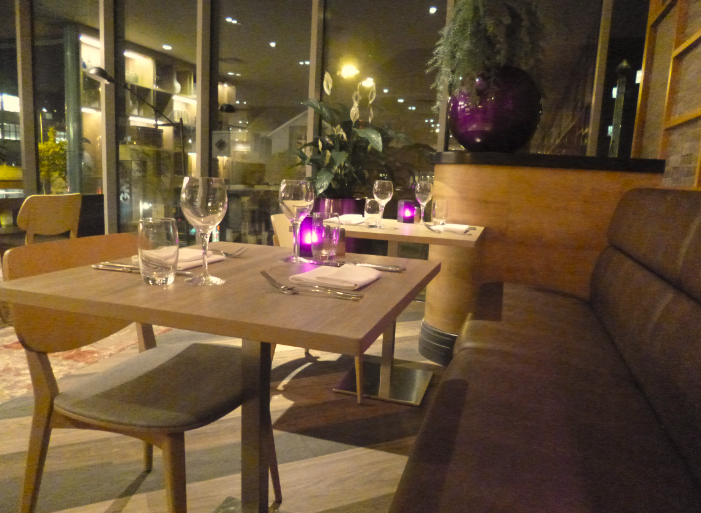 The menu has a strong ‘street food’ influence with an element of Asian dining. This made a welcome change from the norm. I had a particularly delicious starter of Pembrokeshire Crab Spring Rolls, my husband enjoyed Pancetta Wrapped Prawns. We decided to both go for burgers as a main, the presentation of them on contemporary wood boards worked perfectly and they tasted incredible. 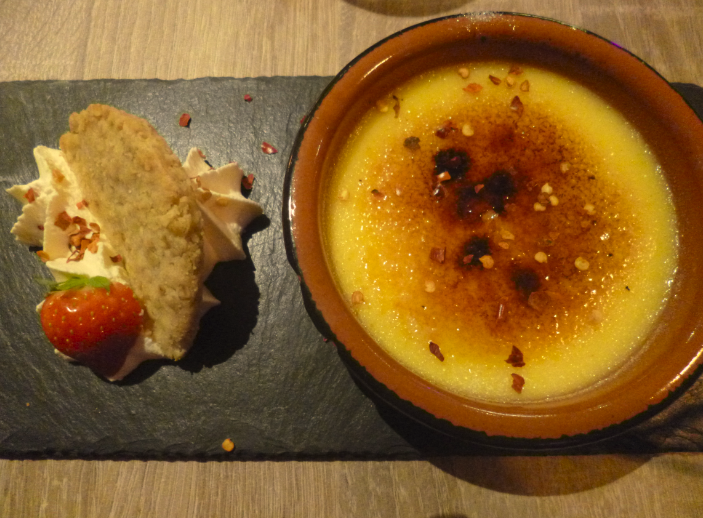 I think dessert was one of the best I have ever had and it was something that I haven’t tried before, we both chose White Chocolate and Chilli Crème Brulee. It was the kind of dessert that you don’t want to end, I was so sad when it was over! 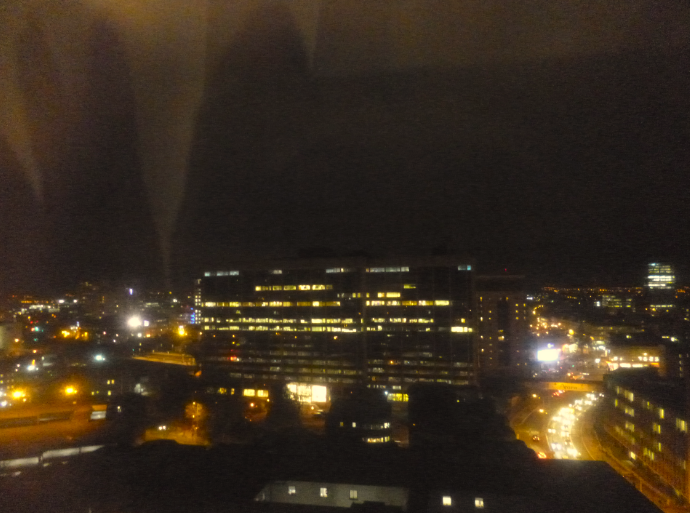 By the time we were back in our room the sun had well and truly set on Cardiff and the view had turned into a magical scene of dazzling lights. It was worth leaving the curtains open for a while to appreciate it. 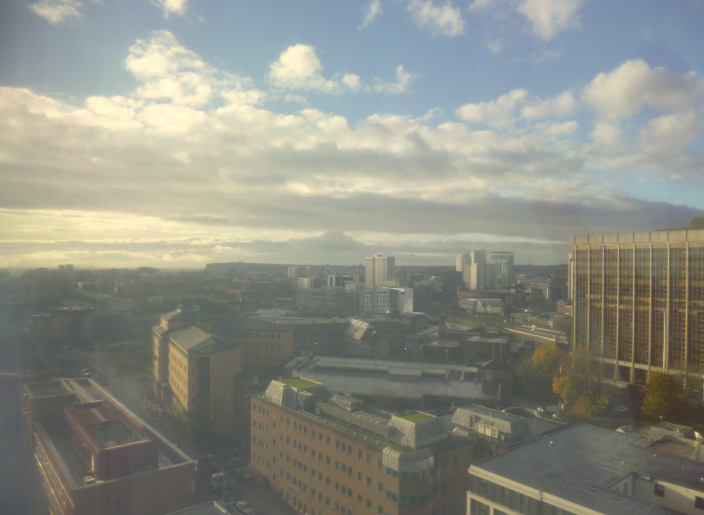 Although the hotel is on one of Cardiff busiest roads it was surprisingly quiet, a definite bonus to a city centre hotel. In the morning we decided to try room service, so we treated ourselves to breakfast in bed. 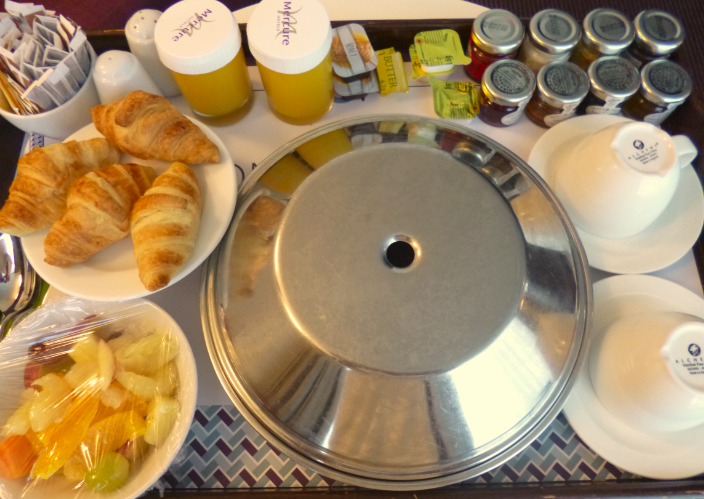 It really felt like we were truly spoilt when freshly made coffee, croissants, toast, fresh fruit and an English breakfast arrived to our room. We sat in the fluffy white bathrobes provided and savoured the moment. It was absolute heaven. Before it was time to make a move, we took some time to admire the art work that is displayed around the hotel. The welsh theme continues with an additional humorous twist. 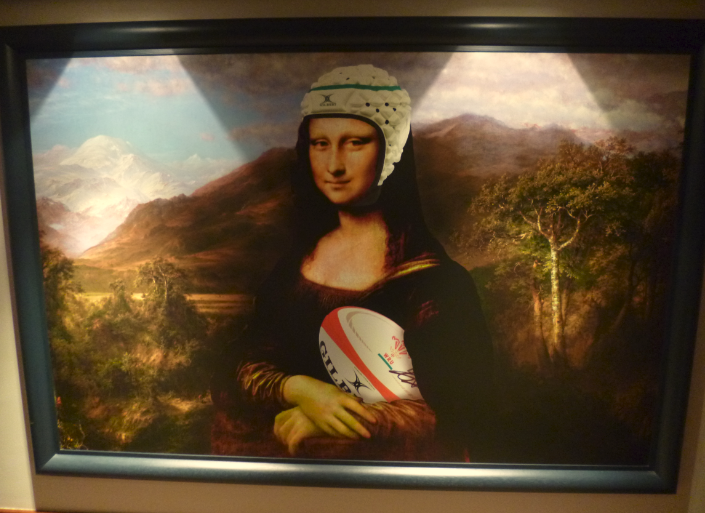 My particular favourite was the classic painting of the Mona Lisa, just as you imagine her except it seems she is a supporter of our welsh rugby team! 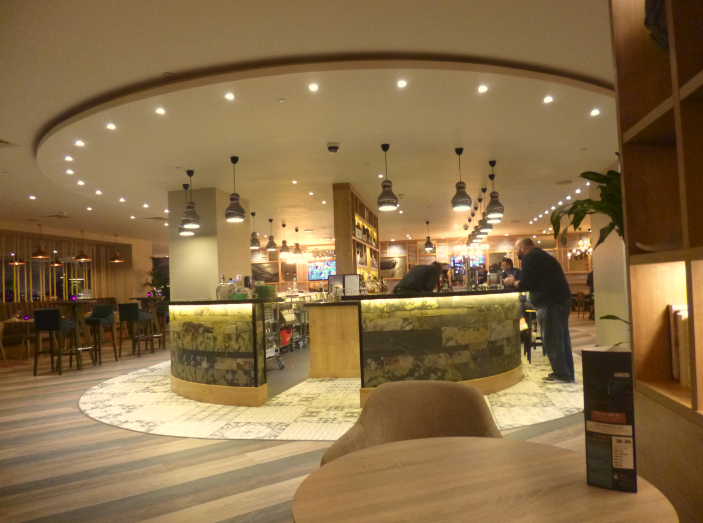 There was time for one last coffee in the lounge before it was time to check out and make our way home. Once again the service was fantastic. 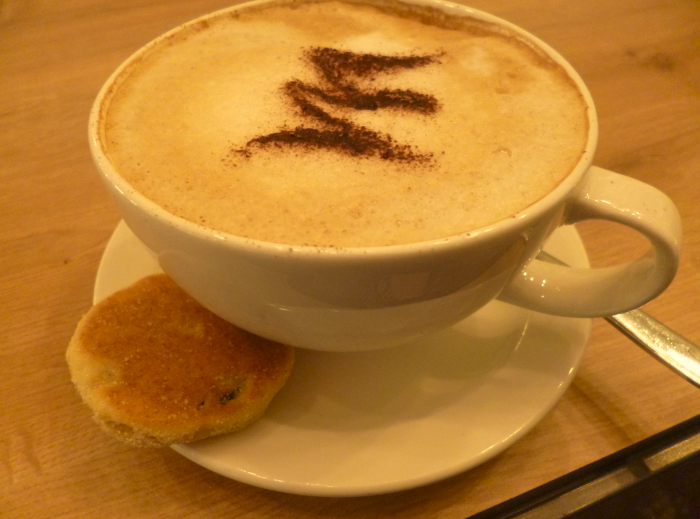 The coffee was delicious and accompanied by a welsh cake. We had a wonderful stay at the Holland House Hotel. A huge thanks to all the staff who were superb throughout. I’m looking forward to visiting again in the future, I think some spa treatments may be on the cards! I would like this opportunity to thank Holland House and the Mercure group for their generous hospitality.